What Is And Is NOT Covered By The Electrical Certificate? What Is The Electrical Compliance Certificate? The electrical compliance certificate is one of the most important documents that a homeowner can get. It also verifies that a qualified electrician was hired to perform the requisite electrical installation work. Essentially, this important document verifies that the electrical work performed in a home (such as the plugs, light fixtures and outlets, DBboard, and wiring) was installed correctly and complies with the legal mandates established in the Occupational Health and Safety Act. The electrical certificate is a legal document that a homeowner must have to verify that the electrical installation in the structure is safe and complies with the law. The certificate verifies all electrical work performed up to the time that it was issued. However, any additional electrical work performed after the time that the certificate was issued must be re-inspected to ensure it also complies with the Occupational Health and Safety Act’s standards. What is important for both homeowners and prospective buyers to know is that the Electrical Compliance Certificate ensures the quality and correctness of the electrical system in the house and its placement. However, it does not guarantee the quality or condition of the actual appliances. Essentially, the certificate evaluates the permanent electrical installation in the structure. This includes the cables that run from the mains to the central distribution board. The main distribution board also includes the sub boards, earth leakage relay, and circuit breakers. Other electrical components in the system include all the cables that run from the main distribution boards to the plugs, switches, and outlets. This includes wall plugs and light switches for all lights in the house. The certificate also checks the wiring and circuits to all of the fixed appliances, including appliances that are connected directly to a wall socket. The certificate also includes the earthing relay system and all of the electrical flow throughout the home. While the certificate verifies the legality and proper functioning of the electrical circuit, it does not include the actual appliances. Along with checking for proper electrical flow, the certificate also checks the proper positioning of the electrical equipment. This includes all plugs and light switches. The plugs and light switches must be a certain distance away from the shower, taps, baths, and other areas where they may come into contact with water. Additionally, the main breaker switch and distribution board must be easily accessible and located a certain height off the ground in the event of an emergency, such as flooding in the home. Before it can pass inspection, the electrical components and materials must be approved by a governing body, such as SABS. The electrical work must also be the correct kind for the structure, and it must be properly rated. The electrical installation work must be securely tightened to prevent sagging or loose connections, and it should be safely out of the reach of children and pets. Before it can pass inspection, the electrical installation has to work properly, as do the safety mechanisms that stop the flow of electricity if there is an emergency. 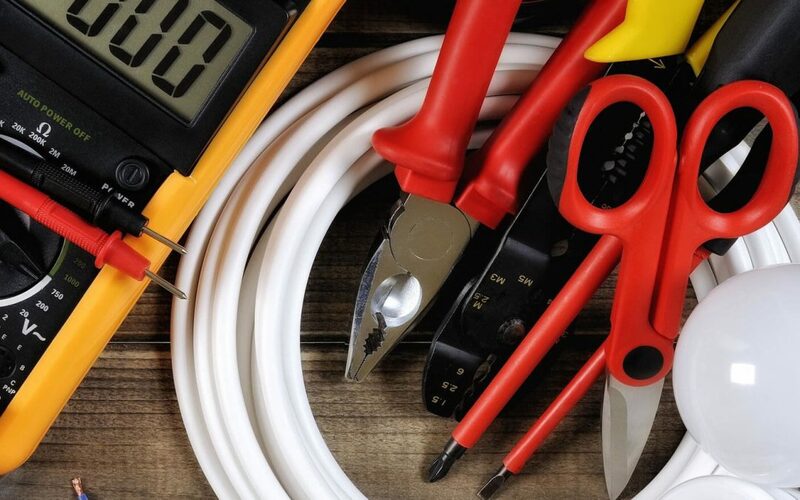 An electrician will also take readings of the electrical circuit to make sure that the insulation, earthing, voltages, and other aspects of the electrical installation comply with regulations. What Is NOT Covered By The Electrical Certificate? The purpose of the electrical certificate is simply to verify the safety and sound working condition of electrical installation within a person’s home. It does not certify that the appliances the electrical system is connected to are working correctly. Furthermore, the electrical certificate does not recommend or force any upgrades or replacements to plugs, outlets, switches, and appliances within the electrical circuit based on non safety-oriented factors like age and aesthetics. As far as the certificate is concerned, any old appliance or outlet is fine as long as it passes the legal requirements to make sure all electrical systems in the structure are working as legally mandated. Although the electrician does not evaluate the condition of the appliances themselves, he or she will check to make sure that all connections between the appliances and the electrical circuit are safe and working properly. Some appliances that the electrician will inspect are the pool lights, bore hole pumps, swimming pool pumps, stoves, ovens, air conditioning units, pond pumps, the alarms, wall heaters, and the HVAC system. Another important aspect to know about the certificate is that it only applies to a permanent electrical installation. Temporary electrical installations are not required to pass the same certification standards. These kinds of installations are classified as devices and appliances that can easily be plugged into the wall and removed by a person. They are considered appliances or lighting fixes that are clearly designed only for temporary or short-term use. This includes things like plugging in a blow dryer for short-term use or plugging a vacuum into the wall to clean a room. Running an extension cord into a room for temporary lighting purposes is another good example of a non-permanent electrical setup that doesn’t require evaluation to earn a certificate. Along with any temporary electrical installation, the electrical certificate does not enforce or recommend upgrades to older homes. Regulations state that every room must have one working light, but they don’t require any more than that. Additionally, there are no legal requirements for the number of sockets or plugs that a room must have. Provided they are in good working order, older fuse boards will also pass the certificate’s electrical installation inspection requirements. Why Is The Electrical Certificate Required? The electrical certificate is required primarily for safety reasons. Electricity, like water, can actually leak out of an appliance if it’s not properly grounded. This can be a dangerous situation, as the electricity can leak out and cause a shock to anyone who touches the appliance that the electricity is distributed to. This situation can be prevented by installing an earth leakage relay, which checks for current leakage that goes into the ground, either directly or indirectly. If the relay senses that the current surpasses a certain amount, it will disconnect or “trip” the current flow to prevent dangerous volumes of electricity passing through to the affected appliance. For that reason, it is critical that all electrical circuits are grounded correctly. This ensures that the earth leakage relay will work as it’s supposed to during an emergency situation in the electrical installation. The electrical certificate is a two-part effort between the electrician and the homeowner. While it’s up to the electrician to perform the physical inspection that ensures the electrical features are functional, the burden is placed on the homeowner to ensure that any electrical component that does not work correctly will not pose a risk of fire or electrocution to any person, animal, or personal property within the building. If there is a faulty appliance or wiring in the house, it’s in the homeowner’s best interest to have the unsafe electrical installation problems fixed as soon as possible. If an injury is caused by the faulty electrical wiring to a person or object, the homeowner can be held legally responsible for the resulting injury or damage. The insurance on the home can also be invalidated by the incident. That can cause even more problems, as it can be very difficult, not to mention expensive, to get insurance coverage back on a home that has previously had its insurance coverage revoked. Who Needs An Electrical Certificate Of Compliance? A current electrical certificate is requires for anyone who “owns” and authorizes the electrical installation work within a given structure. Because a valid certificate is a legal requirement, the homeowner must have the certificate on the premises at all times. In accordance with the Occupational Health and Safety Act, a person cannot market, sell, sublet, or otherwise let another individual handle an electrical installation that is not safe. Therefore, a homeowner who is planning to sell his or her home must get a Certificate Of Compliance (COC) before the home changes ownership hands. Anyone who plans to lease all or part of the house, or otherwise use it for guest accommodations, must also hold a valid COC. The electrical installation must be performed by a qualified electrical contractor, or contracting company, that is in compliance with all codes and criteria established by governing laws and the most current Code of Practice. The electrical certificate will be valid for two years from the time it is issued. Previously, the electrical certificate was valid until the installing electrician performed additional work on the electrical installation or otherwise changed it. This part of the law was changed, however, based on several shortcomings. For starters, wear and tear, which can happen normally to any electrical system, is a major factor in determining how safe and functional an electrical system is. Over time, all electrical components will break down or wear out. Therefore, having a regular inspection every two years is a good opportunity to check for problems and fix them if necessary. Another reason why the electrical certificate is re-issued every two years has to do with home ownership. Before, incoming home owners were simply left to trust the home seller that he or she had not had any additional work performed on the electrical system during the time that he or she lived on the property. As the rules stand, all electrical work must be re-inspected at least every two years. It must also be inspected earlier if additional electrical installation work is performed before the two-year time period comes around. What Is The Process For Getting A Certificate? The Electrical Compliance Certificate can be ordered by either the person selling a home, an attorney, or an estate agent. Anyone requesting the electrical certificate should be aware that there is a fee for the certificate, which is determined before work begins and is calculated on an individual basis. Homeowners usually have to pay two separate fees – one covers the cost of the inspection, and the other covers the cost of all additional work that must be performed to make the electrical system meet all mandatory requirements. Before starting work, the electrician will create a report stating all the work that needs to be done. In the process, it is the electrician’s responsibility to make sure that the work complies with the Code of Practice. After the work order is submitted and approved, it must be accepted by the homeowner or person selling the house. If the transaction is going through an attorney, he or she will need to give the inspector and electrician permission to go ahead with the work. The fee for additional work will be eliminated if the inspector determines that the electrical system is already entirely compliant with the regulations. If this happens, the homeowner will still need to pay the inspection fee, but nothing more. Sometimes, the electrical work will need to be retouched to make it up to code. If this happens, the electrician will create a report stating what modifications need to be made and why. The homeowner can then either choose to accept the quote and continue with the repairs or shop around to get quotes from other electricians. Once any additional requisite work has been completed on the electrical installations, it’s time for the inspector to make his or her evaluation. The inspector generally contacts the homeowner to make an appointment with him or her for an inspection. When the inspector arrives, he or she is obligated to check all electrical installations on the property. This includes plugs, light switches, and the main distribution board. The inspector will check the electrical system in the main house as well as any other structures on the property, such as a garage and outbuildings. The inspector will also check rooftops if they have electrical connections. To make the electrical installation inspections, the homeowner must make sure that all appliances are unplugged prior to the inspection. This ensures that the inspector stays safe, and it also lets him or her take accurate readings. The power will be turned off for the duration of the inspection, but the homeowner is then free to turn it back on again. Inspectors normally plug the electrical appliances back in after completing the inspection, but homeowners should make sure that they are plugged in again after the inspection is finished. This includes refrigerators, freezers, pumps, and other critical electrical components. How Do You Find A Qualified Electrician? Most people are wary of having a stranger come in and work in their home, which is completely understandable! While it never hurts to ask for references and recommendations on a good electrician to use, there are also professional standards to consider that can help distinguish qualified electricians from their peers. The electrician should be registered with both the Electrical Contracting Board of South Africa and the Department of Labour. Any electrician coming in to perform work on the house should provide his or her accreditation certificate and registration card. The accreditation certificate verifies that the electrical installations are safe, but they don’t have to be in working order. For that reason, anyone who wants to do electrical repairs on their home should ensure that they are hiring only the most qualified electrician to perform the work. Once issued, the electrical certificate cannot be changed or modified. This means that the electrician must ensure that the work he or she performs is satisfactory before the final inspection. The home seller must pay for all repairs before the electrician starts work. He or she must also look at the electrician’s report to confirm the payment amount and ultimately agree to pay the fee. If the homeowner does not agree with the scope and cost of the work, he or she may dispute the electrician’s proposal to the Chief Inspector. If the electrical system has been regularly and adequately maintained, the homeowner shouldn’t face extensive fees for any remaining electrical work. A dispute doesn’t technically have to be settled before an individual sells a home. When it comes time to sell, however, many banks require a copy of the certificate, which can only be issued when the work has been performed and inspected. Getting electrical work performed correctly and inspected is an important part of home ownership. If you are in need of electrical work in the Cape Town area, don’t hesitate to contact Abacas Solutions. We have over 20 years of experience, and we are available 7 days a week, 24 hours a day to help you out. Simply call or contact us today online to learn more about what we can do for you!